YES! Heroes and Demons is the first ever Voyager Holo-Romp. Actually, it's Voyager's first romp. And you know how much I love a romp. I was crazy excited about my re-watch for this one. It goes like this: Voyager encounters a strange energy in space and think they might be able to harness it for their ongoing "running out of gas" problem. Instead, the energy takes over the holodeck (with Harry Kim, of course) trapped inside. The only one who can go in and save the day is another holo-person. Namely, (or, er... not namely) The Doctor. What ensues is the character's first away mission and his first big character development episode--oh, and a lot of fun. In the end, The Doc saves the day, kisses a girl, and successfully makes first contact with an alien species. Obviously, I love this one. 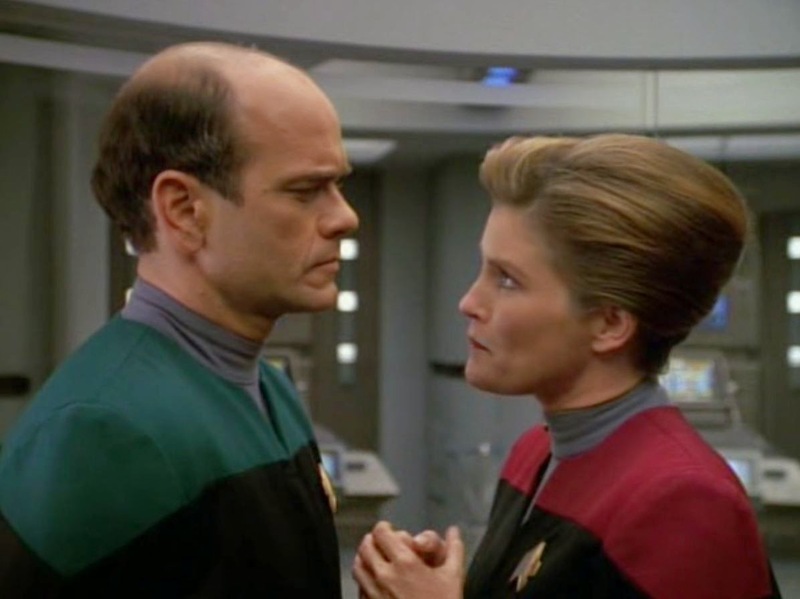 The Doctor is one of my favorite characters in all of Trek and one of the things that irks me most in early Voyager is the way The Doctor is treated. Granted, his mistreatment is pretty understandable. For people who inhabit the Trek-verse, holo-characters aren't people--they're objects. They're used to tell stories or help solve problems or, in the case of Reginald Barclay, to ease one's social awkwardness. But, they don't have rights or quarters or families or friends anymore than a tea kettle does. 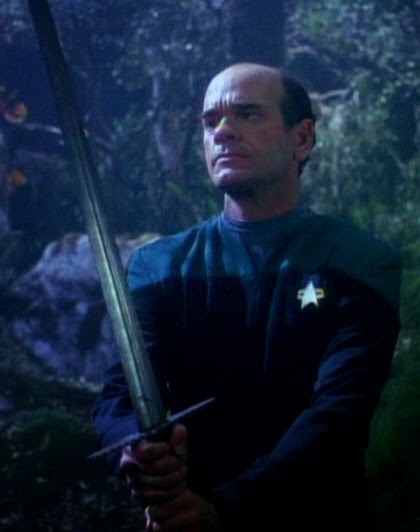 Of course, The Doctor is different--the rest of Voyager just doesn't know it yet. This is the episode makes the wheels of change creak to life. But it's not just about the way the crew begins to see this character differently, but also the way that The Doctor begins to come into his own. He accepts his first away mission in spite of the fact that he was never intended to serve as more than a short-term solution to emergencies. He has had to learn and grow so much already and now he's thrust into a difficult, dangerous, and important mission. If he fails, Harry Kim (and the rest of the crew for that matter) could perish but he faces down his doubts and carries out his mission with the grit and heart of any trained Starfleet officer. He sword fights. He experiences the rush of a fleeting romance. He confronts a monster. He walks away a more interesting, more thoughtful, more well-rounded person. -This episode is packed with Beowulf stuff. -Freya the shieldmaiden begins as a somewhat ridiculous and flat character but rounds out by the end, even describing the way she has always hoped to die. -This nice line from Freya to The Doctor, "Do you know what it's like to be alone among many and unable to speak your fears," is quite nicely done.